silk for caldé: The new Gene Wolfe novel is nearly here! The new Gene Wolfe novel is nearly here! 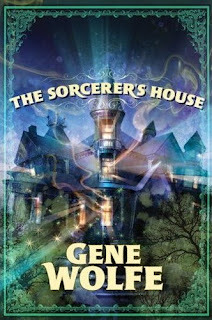 Not long now until the release of Gene Wolfe's latest novel, The Sorcerer's House, on 16 March 2010. In a contemporary town in the American midwest where he has no connections, Bax, an educated man recently released from prison, is staying in a motel. He writes letters to his brother and to others, including a friend still in jail, to whom he progressively reveals the intriguing pieces of a strange and fantastic narrative. When he meets a real estate agent who tells him he is, to his utter surprise, the heir to a huge old house in town, long empty, he moves in. He is immediately confronted by an array of supernatural creatures and events, by love and danger. His life is utterly transformed and we read on, because we must know more. We revise our opinions of him, and of others, with each letter, piecing together more of the story as we go. We learn things about magic, and another world, and about the sorcerer Mr. Black, who originally inhabited the house. And then knowing what we now know only in the end, perhaps we read it again. PS Publishing is also releasing limited editions of the book, with cover art by Dirk Berger and an introduction by Tim Powers. There are Hardcover and Traycased Hardcover editions available. Now I just need to decide which copy to get (although I want all of them! I quite like both covers), and then find the time to read it. I've been contemplating a self-imposed ban on all non-thesis related reading for a while. Right after I finish Guards! Guards! by Terry Pratchett, of course!